What is RIDE & R﻿AI$E? RIDE& RAI$E is a ride combined with a fundraising campaign benefitting Connie Cycling Foundation. Beyond fundraising, R&R is about bringing together a community of cyclists whom share a common vision and belief that improving the lives of kids through sport matters. Although fundraising is not required in order to ride, we encourage you to set up a fundraising page to help raise funds with CCF. The money you raise will go into the general fund and is extremely important to CCF because it helps provide resources that ensure top notch services and help CCF connect with more young people. If you can't ride, please consider making a donation to the campaign. This year marks the third consecutive year for the RIDE & RAI$E campaign and our first year as part of the OC GranFondo ride. We're super excited about the event and hope you'll join us! RIDE & RAI$E provides an opportunity to bring toget﻿her a group of people whom share a common vision and belief that improving the lives of kids through sports matters. 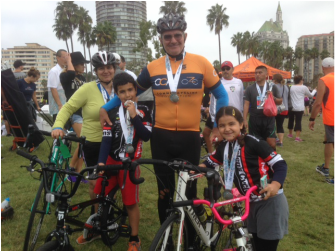 The OC GranFondo has a route to fit all types of riders, from distances for the kids of 1-mile through to the challenging 100 mile route that takes in some of the best scenery Orange County has to offer. CCF coaches will spread out to ride the 1-mile BAMBINO FONDO, 10-mile FAMILGLIA FONDO or the 30-mile PICCOLO FONDO. After the ride, enjoy food, music, vendors and activities for the whole family. There will be snacks and drinks for RIDE & RAI$E participants at the Connie Cycling Foundation tent - located near th efinish in the GranFondo Expo area. The ride start and Registration Packet Pick up is at Irvine Civic Center. Click on the button below to go to the OC GranFondo website for more ride details and to register. ﻿Create yo﻿ur personalized fundraising page. You can help raise money for the campaign by setting up a fundraising page. The money you raise will go into the general fund and is extremely important to CCF because it helps provide resources that make an immediate impact - resources that ensure top notch services and help CCF connect with more kids. And, if you're an active student in one of the CCF programs, you will benefit directly from the funds you raise because you will be rewarded with credit toward future CCF class registration fees when certain fundraising levels are met. Creating your page only takes a few minutes. From your page, you can easily spread the word about your cycling activity and involvement with the R&R campaign through social media and email. Any money you raise will show up on your page as well as add to the grant total raised for the RIDE & RAI$E campaign. Get a RIDE & RAI$E gift whe﻿n you re﻿ach certain fundraising levels. Special Fundraising Rewards for CCF Students. Students currently enrolled in CCF programs are eligible to receive credit toward future class registration fees when certain fundraising levels are met. had a great time, we can't wait until the next one!" thanks Connie!! had a GREAT time!! thank you so much, we had a great time. It was a really well organized well run event." add link here>> coming soon! The ride starts/ends at Irivne Civic Center. Pick-up on October 9 or 10. (pick up the day before the event or on the day of the event. Visit the OC GranFondo website for details about registration, packet pick up, event day parking & logistics, etc.